Browse today’s cheap hotel rates from all over the United States including the amazing Westin Riverfront Resort and Spa for $139 per night. Book this great deal by September 30 and stay at the resort for lower rates through November – including weekends. Colorado is too far away from you? How about an oceanfron room at a Myrtle Beach hotel from $51 a night, a Sheraton hotel room in downtown Memphis from $99 nightly or a Napa Valley resort through fall from $169 per night. Act fast, these deals will sell out very soon! If you travel this Fall you can get a 450 square foot studio at Westin Riverfront Resort and Spa with a kitchenette and a fireplace for $139 to $149 per night. This way you can save up to 70% compared to regular winter peak season prices. 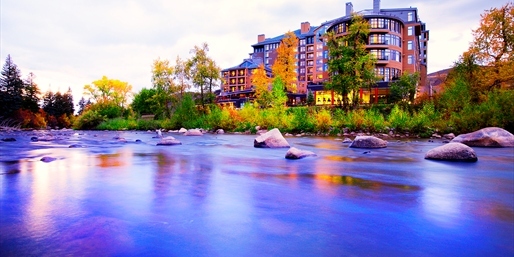 Located in the center of Vail Valley the Westin Riverfront Resort & Spa at Beaver Creek features a 27,000 square foot spa and a golf course, plus you can enjoy activities such as skiing, biking or hiking. If your budget allows you to pay another $20 per night you will also get Wireless Internet access, unlimited local phone calls and Riverfront Club wellness facility with a huge pool (25 yard) and hot tubs. Before you book this deal you must make sure that no one else has a better offer so compare the prices of the competitors for similar deals in the box.